A 20 minute, weeknight one-dish meal from Del Monte that the whole family will love. 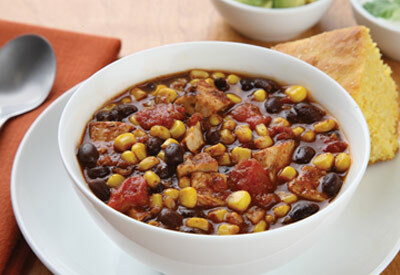 The toppings make it fun and let everyone enjoy the chili just the way they like it. 1. Combine chicken, tomatoes and chili powder in large saucepan. Cook over medium heat about 5 minutes or until sauce is slightly thickened. 2. Add beans, corn, oregano and garlic powder. Simmer 5 to 7 minutes or until heated through. Season with salt, if desired. 3. Garnish with toppings, as desired.